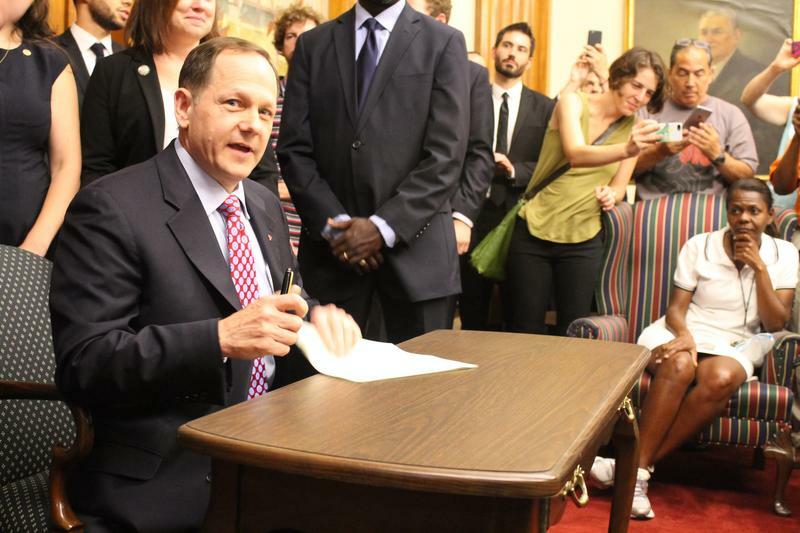 St. Louis Mayor Francis Slay signs an increase in the St. Louis minimum wage into law on Aug. 28, 2015. The state Supreme Court upheld that law today. In 2015, both St. Louis and Kansas City made headway on increasing the minimum wage. St. Louis Mayor Francis Slay signed his city's legislation in August of that year; a Kansas City group, disappointed with its City Council, got a measure to set the minimum wage at $15 by 2020 on last November's ballot. Then, the courts stepped in. St. Louis Circuit Court Judge Steven Ohmer struck down the St. Louis law hours before it was supposed to take effect. A different judge had Kansas City's measure removed from the ballot. Both courts ruled that cities were blocked by the Missouri Constitution from requiring minimum wages higher than what's set by state law. The state Supreme Court ruled earlier this year that Kansas City's measure must get a vote, but did not address the issue of whether it conflicted with Missouri law. The judges rejected that argument in Tuesday's opinion, ruling that cities have the right to order businesses to pay a higher minimum wage. 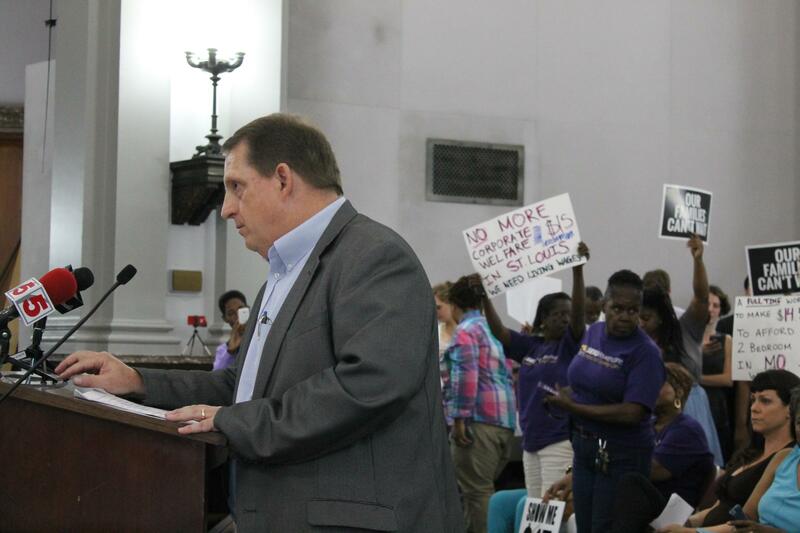 Missouri Restaurant Association CEO Robert Bonney speaks against a proposed increase in the minimum wage in St. Louis in June 2015. The Restaurant Association was a party to a lawsuit challenging the increase. "Plaintiffs [a group of business interests] are incorrect that the Missouri minimum wage law is an affirmative authorization to pay no more than the state minimum wage," Judge Laura Denvir Stith wrote. "To the contrary, it simply sets a floor below which an employee cannot be paid, stating that 'every employer shall pay to each employee wages at the rate of [the current state minimum wage standard.]" Slay said he was happy with Tuesday's ruling. "There is dignity and value in having a job — even more so in one that helps a worker put a roof over her head, food on the table, and save a little for a child's future college education or an emergency medical need," he said. The wage in St. Louis was scheduled to rise over the course of three years, with the first increase taking effent in October 2015. As of Jan. 1, it was supposed to be $10 an hour. Slay said he will give businesses a "reasonable grace period" to adjust to that new wage. Richard von Glahn, the policy director for Missouri Jobs with Justice, said he hopes businesses begin to comply immediately with the higher wage. "Workers have been working hard and waiting for this increase for a long time, and they deserve this increase," von Glahn said. Bettie Douglas, an activist with Show-Me $15, a group that wants to boost the minimum wage even higher, said the ruling is a sign of momentum. "When we started our Fight for $15 an hour and union rights, nobody in Missouri gave us a chance to win," Douglas said in a statement. "But by standing together and going on strike, we’ve secured life-changing raises for fast-food cooks and cashiers, janitors, and home care aides across the city." Jane Dueker, an attorney for the businesses that challenged the law, called the decision "extremely disappointing." 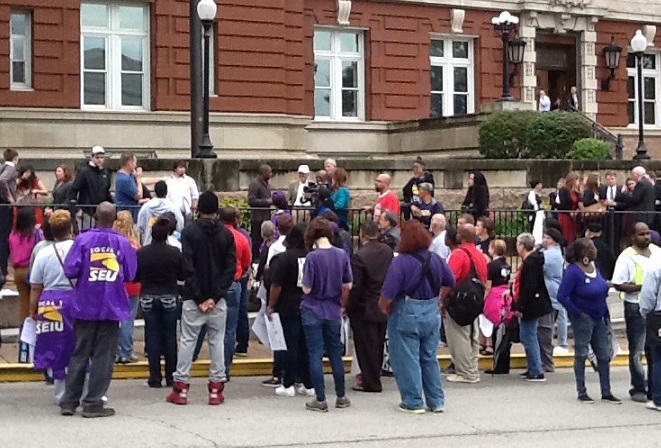 "It's concerning that complying with state law is now a crime in the city of St. Louis," Dueker said. The law is vague when it comes to enforcement, she added, and it was troubling that employees could sue their employers tomorrow because their wages did not go up immediately. Ray McCarty, the president of the Associated Industries of Missouri, which participated in the lawsuit, blasted another "activist ruling." "Despite the liberal Supreme Court’s gross misinterpretation of state statute, money still doesn’t grow on trees,” McCarty said in a statement. "Some minimum wage employees will find themselves without jobs thanks to this misguided decision." This article first appeared in the St. Louis Beacon: Because of flight delays, acting U.S. Labor Secretary Seth Harris had to cancel his trip to St. Louis and Kansas City last week to promote President Barack Obama’s support for increasing the federal minimum wage.